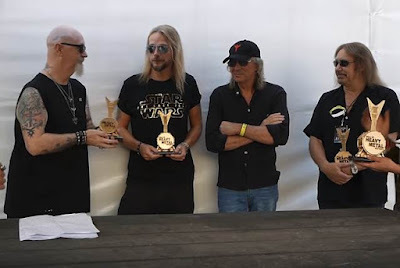 Judas Priest were inducted into The Hall Of Heavy Metal History at the Wacken Open Air festival in Germany on August 2, and official video from the event is streaming online. Hosted by Hall board members Whitney Alyson Ribbins and Steve Göldby, the private ceremony took place prior to the band’s headlining appearance before 80,000 fans at the annual festival as part of their “Firepower” world tour. "Judas Priest are thrilled and honored to accept induction into the Hall Of Heavy Metal History and be amongst so many of our friends,” says the group. “This also sends a great message of inclusion for the Metal community around the world and keeps us defending the Metal faith together." "We have made sure that Judas Priest finally gets the induction and respect they truly deserve," said Pat Gesualdo, founder/CEO of the Hall Of Heavy Metal History. "We thank them for the decades of hard work and dedication to heavy metal, an art form they helped establish." Following the ceremony, Judas Priest delivered an 18-song set of classics and tracks from “Firepower”, where they were joined by guitarist Glenn Tipton for a three-song encore. Formed in Birmingham, UK in 1969 and fronted by original vocalist Al Atkins, it was the arrival of singer Rob Halford in 1973 and their debut album, “Rocka Rolla”, a year later that launched Judas Priest on an international basis that would lead to a catalog of 18 studio albums and worldwide sales of almost 50 million copies. The Hall Of Heavy Metal History recognizes legendary figures in the genre while raising funds to establish free therapy services and programs to help disabled children and their families as part of the non-profit organization D.A.D. (Drums and Disabilities). Judas Priest will join Deep Purple for a series of North American shows that will begin in Cincinnati, OH on August 21.